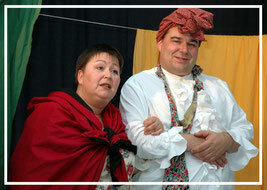 Visit the Theater Nedelmann - the only residential theater in Germany. Forget an evening of great, mundane playhouses and expensive productions. Here, in the living room of the Nedelmann family, you will experience two full-bleed actors, who will give you an unforgettable theatrical performance with heart and talent, for the price of a cinema visit. A special journey of time awaits you in the Grube Messel. Our hotel is an ideal starting point for visiting the Unesco World Heritage site. Discover the fascination of earth-historical events and their significance for our culture and daily life! The pit with the newly opened visitor center is about 15km from our house easily accessible. Culture, music and a varied program are available in the Kulturhalle. The well-known venue is 15-20 minutes walk from the hotel. When were you last in the cinema? Our local cinema shows the current productions. If you are looking for a great mundane Kinopalast, you are wrong here. Instead, a small, nice cinema awaits you with pleasant prices and modern facilities. And from the movie theater to the hotel bar it is only a maximum of 10 minutes, promised!